Important Note: Harvard Foosball Tables are no longer being sold new (that we can find), and so your best bet is going to be on places like Amazon or eBay. However, even there, you’re unlikely to find anything. Your best bet is to check out our Best Foosball Replacement Parts article, where we cover some of our top picks for everything from men to rods to bearings to balls. Harvard Foosball Table Parts are essential for the average and the professional foosball player. While foosball may not be physically brutal for the human players, those who “suffer” the most are the table, the handles, the tiny plastic Foosball Players, and even those metal rods and handles. Just like anything else precious to you and me, Foosball Table Parts are important to maintain the foosball table. 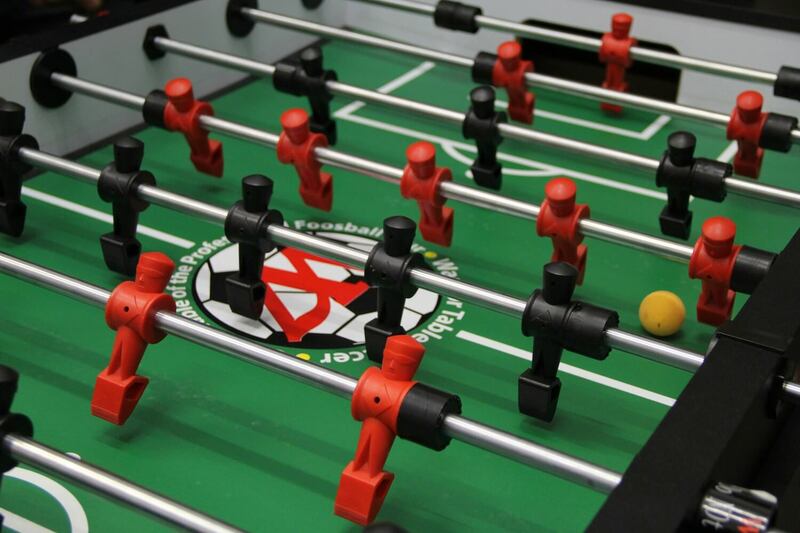 With a properly-maintained foosball table, we can continue to enjoy playing for years. For the proper maintenance of your foosball table, you should know about some accessories and parts that may just be needed whenever a portion of your foosball table breaks down. 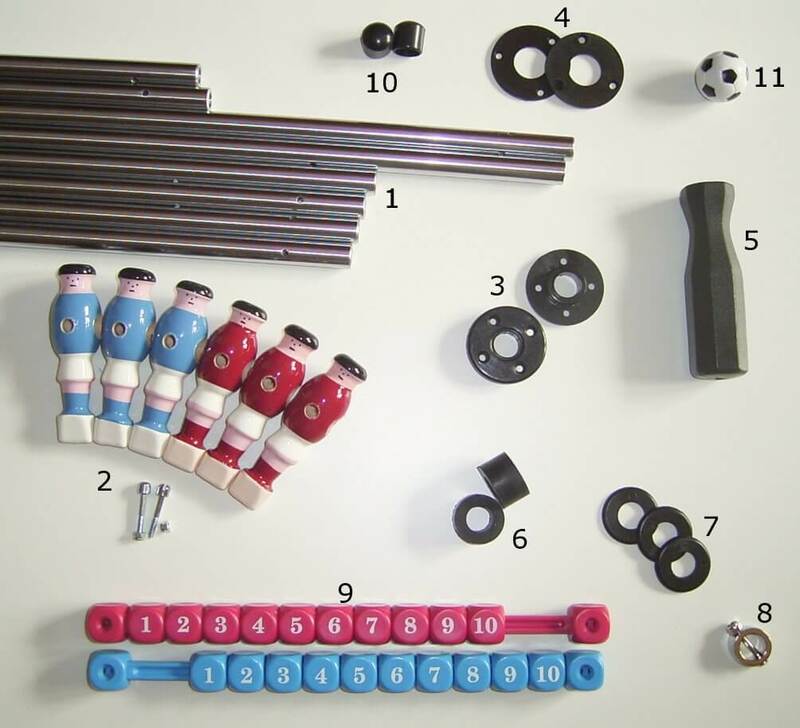 These parts include players & men, bars & rods, silicone, bearings, bumpers, balls, handles, legs, tubes, wraps, table covers, and pin punch & roll pins. Those little guys – the foosball men and players – are the all-important spare parts. Broken or chipped foosball men do not inspire a great foosball game. If your foosball men have slick or rounded toes, then it is time to replace them with foosball men that have pointed toes. Cross-hatching patterns on their feet enable better control of the ball. Some low-end foosball tables com with men that have slick and round toes. Professional and hard-core players may want to replace with the pointy-toe ones. However, children or amateur foosball players can still play with the basic foosball men as all they are concerned about are hitting the balls and learning the basics of playing foosball. While secondary to the tiny foosball men, foosball bars are rods are also highly important to the maintenance of the foosball table. Foosball rods also ensure a great game of foosball. Cheaper tables have heavier rods, which make the game sluggish and slow. This hinders one’s ability to shoot the ball as it will be hard to laterally move the rods. The more expensive and high-end foosball tables have light-weight and hollow chrome rods, which allow a smooth glide between the bearings so that the player can get optimum shot performance and ball control. An important feature to look in tables is the safety plastic caps. These caps are found at the rods’ ends that may indicate whether the bars are solid or hollow. One has to make sure to look at this before buying a foosball table. Another important replacement component to ensure a great foosball game is the foosball bearing. The bearing is inserted in the side holes of the table between the hole and the rod. One can easily make fast shots with a good bearing. Quality bearing parts enable faster shots and smooth rod gliding. One has to be sure that the foosball table maker does provide quality bearings. Bearings must also be maintained properly. You may apply one or two silicone drops at each end of the rod adjacent to the bearing. The bottom line is that quality parts make a great foosball game. Those Harvard Foosball Table Parts may come in handy when the time comes for your or me to main that foosball table.